Bill Gross, Wall Street's so-called Bond King, has some harsh words for President-elect Donald Trump -- who has proudly referred to himself as the King of Debt. Gross, who became famous in financial circles as a bond guru at PIMCO and now runs a fixed income fund at Janus (JNS), wrote in his new monthly outlook Wednesday that Trump's proposed economic policies may not change much for struggling Americans. "Greater defense and infrastructure spending combined with lower corporate taxes to invigorate the private sector continue to favor capital versus labor, markets versus wages, and is a continuation of the status quo," Gross wrote. Gross even went so far as to predict that Trump will not be re-elected in 2020. "His tenure will be a short four years but is likely to be a damaging one for jobless and low-wage American voters," Gross wrote. Gross did not mince words at all, saying "the Trumpian Fox has entered the Populist Henhouse," and that Trump won because of "America's misinterpretation of what will make America great again." Gross added that he did not vote for Trump or Hillary Clinton though. He argued that she might not have been much better for the bond market -- or average Americans either. "The Clinton Democrats and almost all Republicans represent the corporate status quo that favors markets versus wages; Wall Street versus Main Street," Gross wrote. Related: Will Trump get hit with a recession? Gross also points out that he disagrees with Trump's contention that cutting corporate taxes will lead companies like Apple (AAPL)and other tech giants hoarding cash overseas to bring some of that cash back to the U.S. and use it to invest here. Gross called that logic "doubtful" and said the last time there was a tax holiday for businesses in 2004, "no noticeable pickup in investment took place." He said most of the cash was spent on dividends, corporate bonuses and stock buybacks. Gross was particularly gloomy about what the Trump win, which some have dubbed America's Brexit, means for the U.S. economy. "Global populism is the wave of the future, but it has taken a wrong turn in America. Investors must drive with caution, understanding that higher deficits resulting from lower taxes raise interest rates and inflation," he wrote. Still, some argue that the latest rant from Gross about the health of the U.S. economy and politics is just sour grapes. He has been hammering on this theme for some time now. Why? It could be that that the writing may be on the wall for Gross and other big bond investors, who have benefited from unusually low interest rates for nearly three decades. Ross Gerber, president and CEO of Gerber Kawasaki Wealth and Investment Management, tweeted that Gross is probably so grumpy because he realizes that stocks are probably going to outperform bonds for the foreseeable future. The 30 yr bond bull is over. That's why Bill Gross is always so unhappy. No more wind at his back ever again. The wind is behind stocks now. If Trump is able to get Congress to approve a $1 trillion package to improve the nation's roads, highways, bridges and other aging infrastructure, that should lead to higher bond yields if the U.S. sells more debt to finance the plan. What's more, the Federal Reserve seems ready to boost short-term rates at its next meeting in mid-December. The Fed could raise rates several times next year too. The combination of Trump stimulus and Fed rate hikes would be bad for bond investors like Gross. The yield on the benchmark 10-year Treasury bond is now hovering around 2.25% -- up sharply from a low of about 1.34% this summer when investors assumed (incorrectly as it turns out) that Clinton would beat Trump. And rates may continue to climb, which would mean even more pain for Gross and other bond bulls. 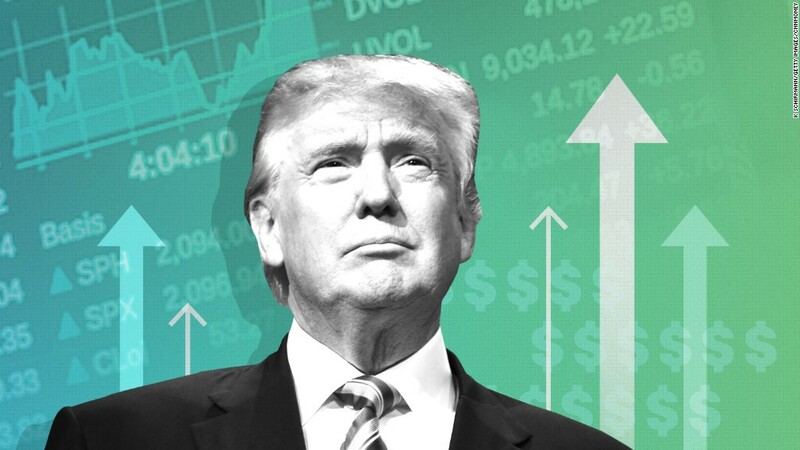 Krishna Memani, chief investment officer with OppenheimerFunds, said in a report this week that the 10-year could easily rise above 3% during the next year if Trump gets his stimulus plan through Congress and also cuts taxes. "The stimulus and/or tax cuts would have to be substantial enough and at levels that can't be paid for. In other words, the Republican Congress will have to go along with the will of Donald Trump and bear with its distaste for deficit spending," he wrote. That could be good news for infrastructure stocks and other parts of the market. Stimulus hopes are one big reason why Caterpillar (CAT) and other construction companies have surged in the wake of Trump's win. But Gross isn't buying it. "There is no new Trump bull market in the offing. Be satisfied with 3-5% globally diversified returns," he wrote. Hmm. I wonder if Trump, who swore off Twitter for what seemed like only a day or so, will now tweet nasty things about the "sad" returns for Gross-led funds at Janus and PIMCO during the past few years.